Pentagon Papers - WHAT ARE THE PENTAGON PAPERS? 1. WHAT ARE THE PENTAGON PAPERS? 3. WHO SUPPORTED THE WAR? 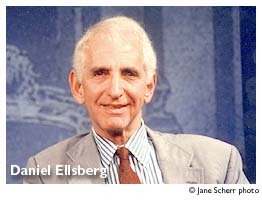 Daniel Ellsberg was a Defense-Department researcher who leaked top-secret Pentagon papers to the press. This photo depicts Ellsberg at the U.S. Capitol on July 28, 1971 as he appears before an unofficial House panel investigating the significance of the documents. In addition to Ellsberg are, from left: Fred Branfman (former Laos correspondant for Dispatch News Service); Ellsberg; and Rep. Don Edwards (D-California). Photo by the Associated Press; provided here as fair use for educational purposes. Richard Nixon (sworn-in as America's president on January 20, 1969) and his Oval Office predecessors were about to undergo the kind of scrutiny no Administration wants to face. Why was Nixon, whose Administration was not the focus of the study, so enraged? How did the battle between the federal government and the American press begin? One of the researchers who worked on the study, Daniel Ellsberg, was employed by the Rand Corporation. That company assigned Ellsberg to work as a consultant to the Pentagon. As researchers gathered information one thing was becoming clear: The study would be extremely damaging for the government. Top-secret documents reveal arrogance, ignorance, ineptitude and miscalculation by high-ranking federal government officials. Worse, the study confirmed what many Americans had long been thinking: They were not told the truth about Vietnam. Study researchers, reviewing top secret memos, learned that government officials had not fully disclosed the extent of U.S. military involvement in Southeast Asia. Even more troubling, official files proved the United States government knew about (and probably encouraged) the coup d'etat that resulted in the November 1, 1963 assassination of South Vietnam's president, Ngo Dinh Diem, and his brother, Ngo Dinh Nhu. One of the most shocking aspects of the study revealed a completely different version of the August, 1964 Gulf of Tonkin events. Had the facts which caused Congress to grant President Johnson extraordinary powers been twisted to guarantee that desired result? Was the escalation of American involvement in Vietnam based upon deliberate misrepresentations? This was the stuff of great news stories—except that the study was top secret and not available to the press. Bos, Carole "WHAT ARE THE PENTAGON PAPERS?" AwesomeStories.com. Sep 01, 2005. Apr 24, 2019.